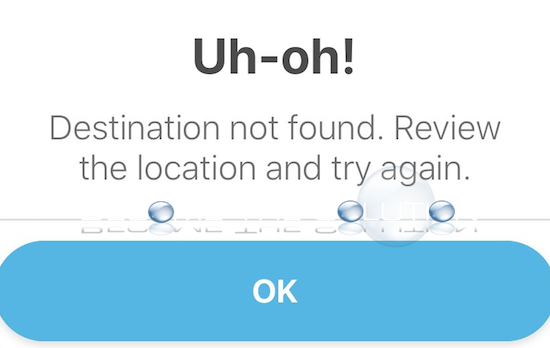 If you attempted to calculate a route in Waze, you may receive a message about the destination could not be found. If you receive the message Can’t find a route, refer to this post. This happens primarily for the following reasons below. Your device using Waze does not have an active Internet connection. Ensure you are connected to a Wi-Fi network or your cellular data network. If the Waze app was recently updated, wait for new prompts to finish downloading first before calculating a new destination. In some cases, if you are trying to route a destination of ~1000 miles or more, Waze may have trouble calculating the entire route details in real-time including traffic alerts, user reports, construction updates, traffic, and other reports. Try waiting a few minutes before calculating the route again. All else, try to set the Waze routing preferences off to allow faster calculation of your route. Go to Settings -> Navigation and turn off the following options: avoid toll roads, avoid freeways, avoid ferries, and reduce difficult intersections.